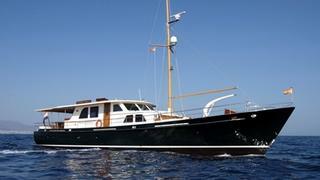 Nol Kneulman at Van der Vliet Quality Yachts tells me of a €500,000 price cut on the 24.3m motor yacht Time Out. Built by Holland’s Vennekens yard in 2007 with ocean cruising in mind, she features extensive deck spaces and a large saloon for entertaining. Time Out accommodates six guests in a master stateroom and two twin cabins, while twin 259hp Cummins engines give her a cruising speed of 11 knots.